There are a number of interesting ghost towns in southern Arizona, especially in the area around Tombstone, and in or near Coronado National Forest. I'm including towns that are completely abandoned, as well as towns that still have residents -- albeit less than their "boom" days. You'll travel on some dirt roads if you go to all these towns, but only one of them, KOFA, requires 4-wheel drive. A high clearance vehicle is always useful when searching for ghost towns. We'll start our tour east of Phoenix in the Superstitions, and continue clockwise through the southern part of the state, ending in the southwest corner of Arizona at Yuma (or KOFA, if you're adventurous). The 158,000-acre Superstition Wilderness (and environs) has it all for the Western explorer – a ghost town (Goldfield), Indian ruins, abandoned ranches, and abandoned mines. And, perhaps most important of all, a tale of a fabulous lost gold mine – the Lost Dutchman Mine. 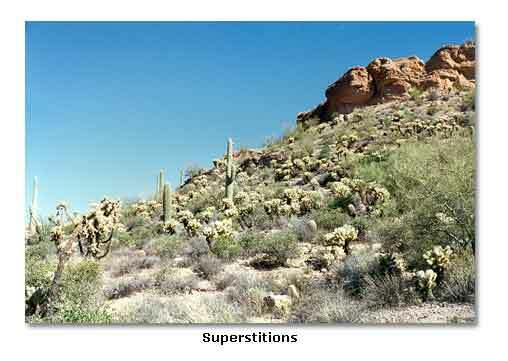 There is no question that there is/was gold in the general area of the Superstitions. In the Goldfield area (near the modern day Lost Dutchman State Park), several large gold mines operated beginning in 1892, including the Mammoth Mine and the Bull Dog Mine (one mine was still producing in the 1970s). But there has always been some debate as to whether any gold was ever mined in the Superstition Wilderness itself. There are many versions of the Lost Dutchman Mine story, but here is a conservative version. Sometime in the late 1870s or 1880s, a German named Jacob Waltz and his partner Jacob Wiser are said to have discovered a fabulous gold mine in the Superstitions. There are various versions of how they found the mine, ranging from the two Jacobs stumbling upon some Mexican miners already working the claim, to having had a map given to them from a man they rescued from a card-game fight. Before Waltz died in 1891, he told two companions the location of the mine. People have been searching for the Lost Dutchman Mine ever since. Did the mine ever exist? If so, does it still exist today? Has the mine already been discovered and mined secretly or was it incorporated into one of the Goldfield-area mines? No one knows the answer to those questions, but people have been searching for the last 100+ years for the fabled fabulous mine. There are many hiking and exploring opportunities in the Wilderness, as well as a splendid little state park/campground in the northwest corner. The Superstition Wilderness is located east of Apache Junction (40 miles E of Phoenix). Continuing clockwise from the Superstitions to the area northeast of Tombstone, the next stop on our tour is Fort Bowie. The trailhead to Fort Bowie is located 13 miles south of Bowie on Apache Pass Road. 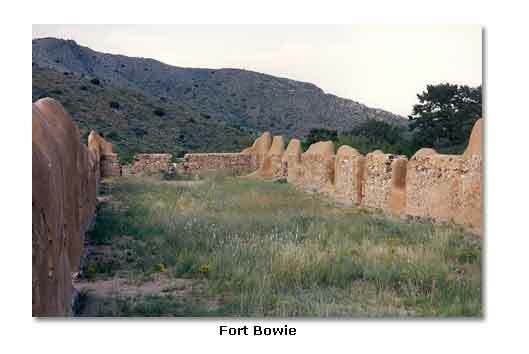 Fort Bowie was a military fort established in 1862 to fight against Geronimo and the Apaches. Its raison d'etre ceased after Geronimo's surrender in 1886, and it closed soon after. Many of the buildings were dismantled in 1911 when the site was sold. It became a National Historic Site in 1964. A 1.5-mile walk is required to get into the site. There are several adobe and stonewalls remaining, in a particularly picturesque setting in the Chiricahua Mountains. I should point out that one of my three close encounters with a western rattlesnake happened on this trail, so keep your eyes – and ears – open. Our next stop is Pearce, located 29 miles S of Willcox (off of US 191). Legend has it that Jimmie Pearce discovered a rich gold vein by accident one day in 1894. His discovery led to the development of the Commonwealth Mine. 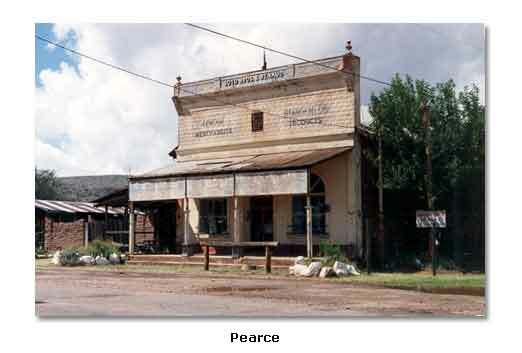 A post office was established in Pearce in 1896, and the population had mushroomed to 1,500 by 1919. Between 1894 and the 1930s, $30,000,000 in ore (gold and silver) was mined. It is said that gold bars were sometimes made intentionally heavy, so that thieves wouldn't be able to rob the gold shipments (this practice was also successfully utilized in Panamint City in Death Valley). Today there are several standing buildings from the boom days, including the wonderful “Soto Bros. and Renaud” General Store, and an adobe church. 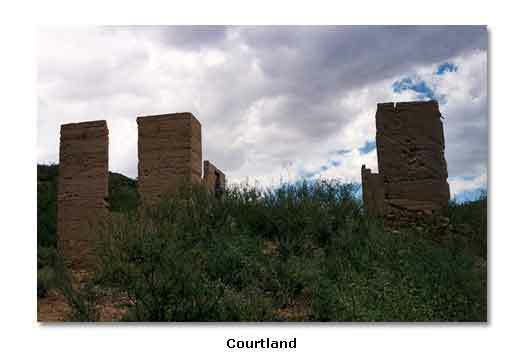 Next on our tour is Courtland, located 22 miles northeast of Tombstone. In 1909, Courtland mushroomed from nothing to a town of over 2,000 people in a very short time due to the discovery of copper there. Four mine companies and two railroads (including the El Paso and Southwestern) rushed into the town. By the 1920s, the copper ran out, and the town started to decline. The Post Office closed in 1942. All that’s left in Courtland are the shells of two buildings, one of which is the old jail. The ruins are easily seen from the road that runs between Pearce and Gleeson. 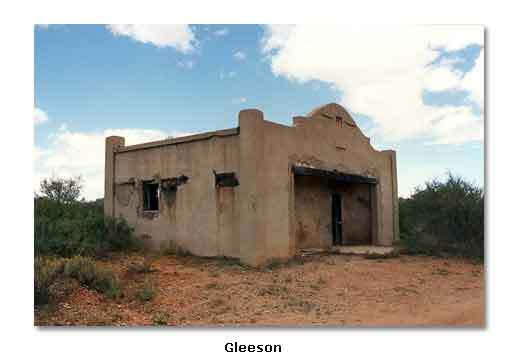 Gleeson is located 16 miles east of Tombstone. It was founded in 1900 near the site of an earlier mining camp named Turquoise (after a nearby mountain). The name Gleeson came from a prominent Irish miner named John Gleeson. By 1909, the town had a population of about 500. A fire wiped out much of the town in 1912, but the World War I demand for copper assured its survival for a while longer. The Post Office closed in 1939. Today, there are several interesting buildings remaining, including a jail and a school, as well as a few residents. Next, we’ll stop in Tombstone, located 72 miles east of Tucson. While hardly a ghost town (the 2013 population was 1,338), Tombstone was the most important town in the area during the boom days. Tombstone gets its colorful name from one of its original prospectors named Ed Schieffelin. When his associates heard he was going to prospect in the area, they told him that he would only find his tombstone in this Apache-dominated land. Ed did indeed find silver in the area, and in its mining heyday (1880-1886), Tombstone was a rich producer. At its 19th century peak, Tombstone had a population of 15,000. The most famous event in Tombstone history occurred on October 26, 1881, when Wyatt, Virgil and Morgan Earp, aided by Doc Holiday, faced down the Clanton and McLaury brothers at the OK Corral. The fight lasted only a minute or so, but when it was over, the McLaurys and Billy Clanton were dead or dying. 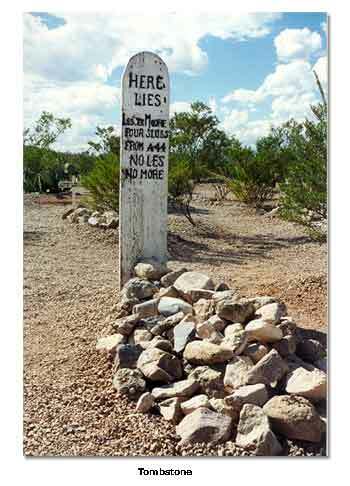 They are buried in the famous Boot Hill cemetery. There are many well-preserved remains in Tombstone, including the O.K. Corral, the Cochise County Courthouse, the Bird Cage Theater, Boot Hill (“Here lies Lestr Moore, four slugs from a 44. No Les, No More”), and the office of the Tombstone Epitaph. Moving 9.5 miles west from Tombstone, our next stop is Fairbank. An Indian village existed on this site as early as 1700, but its creation in 1883 coincided with the mining boom in nearby Tombstone. 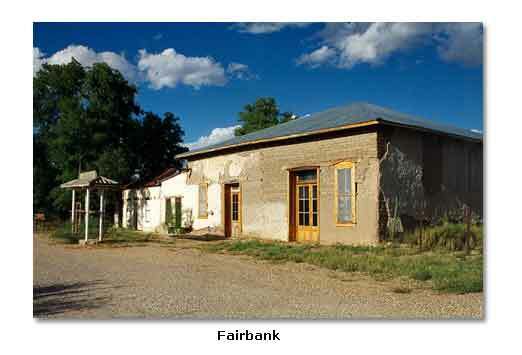 In the late 19th century, Fairbank operated as a railroad supply town for Tombstone and Contention. In the 1880s, over 100 people lived here. Fairbank has a picturesque (former) post office/mercantile store, several private residences, and a pleasant mile walk back to an old mill. It is located just south of SR82, on N. Old Fairbank Road. If you like your ghost towns completely abandoned Charleston, located 9.5 miles southwest of Tombstone (and 6 miles as the crow flies from Fairbank) could appeal to you. Charleston, located on the bank of the San Pedro River, served as a mill town for nearby Tombstone. (The mills themselves were actually located in Millville, across the river from Charleston). Founded in 1879, by the 1880s the population was over 400. When the mines in Tombstone went bust in the late 1880s from flooding, Charleston went bust, too (the Post Office closed in 1888). There are only a few stone walls left in Charleston and Millville. An earthquake in 1887 destroyed much of Charleston, and war games during World War II destroyed the rest. Charleston is very difficult to find, so here is my take. From the Mormon Battalion monument, follow the San Pedro River bed NW for about 3⁄4 of a mile. When you see some modest cliffs on the west bank, find a place to climb to the top. What’s left of Charleston can be found at the top of the cliff. We now move to three towns located in or near Coronado National Forest. The Coronado National Forest covers 1,780,000 acres, mostly in southeastern Arizona. Harshaw is located 8+ miles SE of Patagonia. 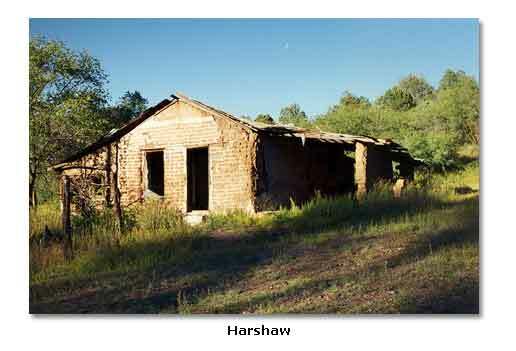 Harshaw has been occupied by Indians, Spanish padres, Mexican families, and miners in its history. The Mexicans called it “Durazno”. It became Harshaw in the late 1870s, named after a miner that made it big there. For two years (1879-1881), Harshaw was a boom town. In 1880, Harshaw had a population of 600 people. Fire and flood brought it down, and it never recovered  the population had dwindled to 100 by the late 1880s. The Post Office closed in 1903. Today, there are a couple of interesting dwellings that have survived the ravages of time. Duquesne is located about 5 miles NW of Lochiel, about 13 miles south of Harshaw. Duquesne was founded in 1890 when the Duquesne Mining and Reduction Company of Pittsburgh established a company town there. They also established a mill in nearby Washington Camp. Like many mining towns, its life was short-lived - the Post Office closed in 1920. 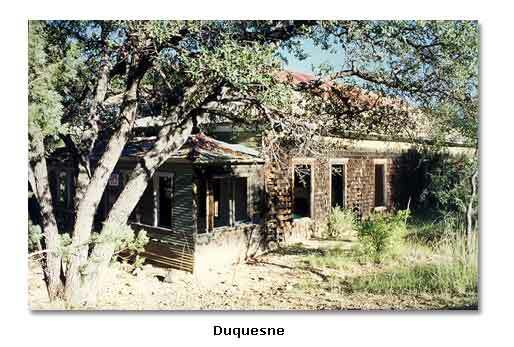 There are several significant buildings still standing in Duquesne, which is located on a loop road above the “main” road that goes through Washington Camp. Lochiel is located about 24 miles east of Nogales (and about 5 miles southeast of Duquesne) on the Arizona/Mexico border. Lochiel has had various names in its existence, including Luttrell and La Noria. In 1881 (as Luttrell), the population was 400. A Post Office was established as Lochiel in 1884. In addition to its mining past, Lochiel was visited by Pancho Villa numerous times in the early 20th century (with less dramatic results than at Columbus, New Mexico!). 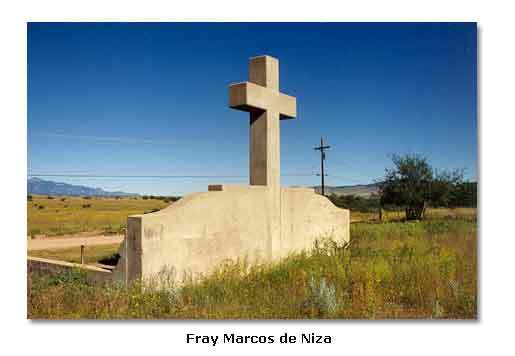 Also, there is a monument in Lochiel to Fray Marcos de Niza, a Franciscan monk, and the “first European West of the Rockies” (1539). Today, Lochiel has a small U.S. Customs station. 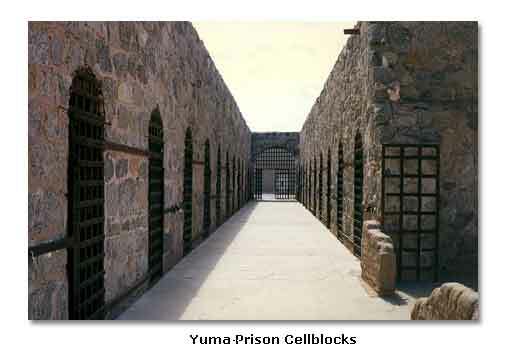 Continuing west on our tour, we eventually come to Yuma, home of the Yuma Territorial Prison (Prison Hill Rd. in Yuma, Arizona). Yuma Territorial Prison operated from 1876-1909, and housed over 3,000 prisoners in its brief history. The site also served as Yuma Union High School from 1910-1914. The prison is well preserved. Among the structures still left to see are cell blocks, the guard tower and the sally port. Yuma Territorial Prison is now an Arizona State Historic Park. We end our tour of southern Arizona ghost towns at KOFA. KOFA (short for King of Arizona) was a bustling gold mining operation in the early part of the twentieth century (the Post Office was established in 1900). KOFA mine shut down in 1910, although there was sporadic mining in the area in the late 20th century. Today, there is nothing but rubble at the site, including several old cars, and some concrete pads from later mining. One of the reasons that some of these towns are so well preserved is because most of them (Charleston and KOFA being the exceptions) have never been totally abandoned. This is great from the standpoint of preservation, but it may limit some of your exploration activities - many of the buildings in these towns are on private property. Please respect posted “No Trespassing” signs.